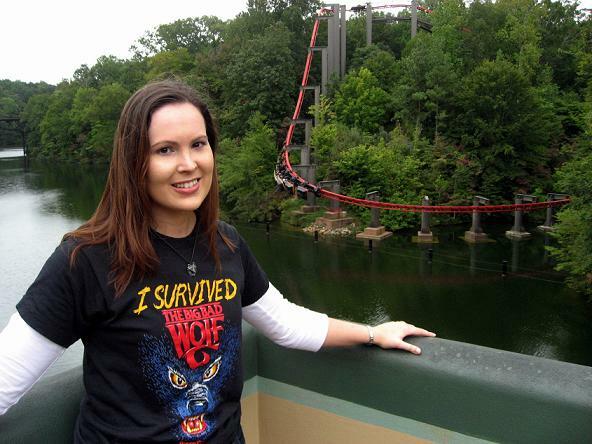 I survived the Busch Gardens Williamsburg Coaster Tour, the question is, have you? For those of you teetering on the fence about whether to purchase a ticket or for those who may not have even known about the coaster tour; don’t hesitate – Get your ticket and head out there! 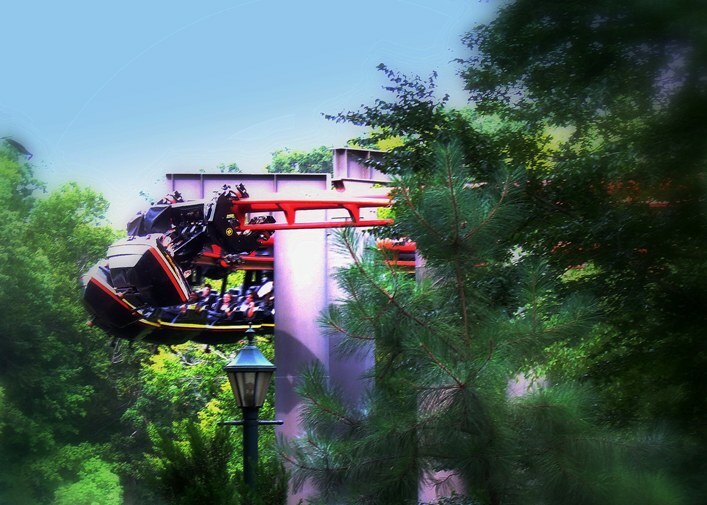 The relatively new Roller Coaster Insider Tour is a must see for any person with a strong passion for either Busch Gardens Williamsburg or World Class Coasters. My set date was March 27, 2010; a cold March Morning; one that barley passed the temperature restriction for riding the coasters. Arriving at the parking lot, I was personally escorted in by a company vehicle and was given a parking spot in the very first row of the England Parking Area. OK, for those of you not familiar with this; I have been coming to the park for over 30 years and have NEVER had the good fortune of landing such a parking spot. EVER. Already, I felt like a VIP. 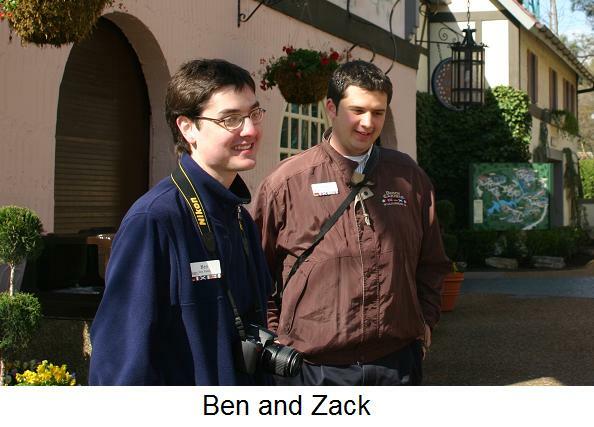 Ben & Zack, our two designated tour guides, greeted us and took us onward into the park’s main entry way and I immediately noticed something amiss from my normal visits to the park. It was quiet. No music or crowds; just carts being moved around and a spattering ensemble of maintenance work being done. Eerie perhaps, but pretty much just how I envisioned the park to be before the gates officially opened. Destination number one on the Coaster Tour (besides the bathroom) was The Classic Loch Ness Monster Coaster; an honor well deserved by its legacy. Good ol’ Nessie is an ACE landmark and should always be the anchor of the Park. Testing of the Loch Ness was happening at the moment of approach and while standing underneath the interlocking loops, we were able to see all the coasters in the nearby vicinity being sent out on test runs in the odd quiet. It was definitely intriguing to see maintenance workers hopping across tracks like Kung Fu Movie Stars and hearing secret codes being called out over the announcement speakers. 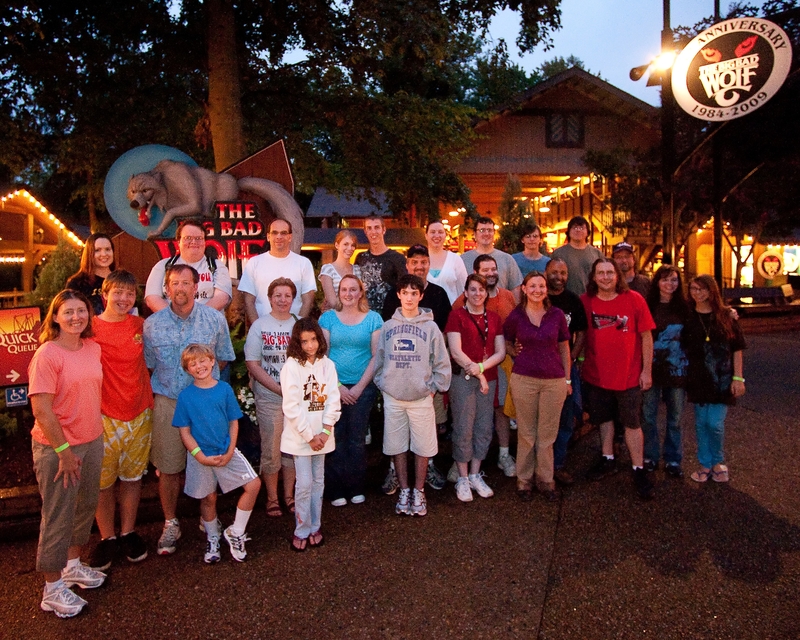 We were then led underneath into Nessie’s Lair of coaster lore. You know, behind that mysterious door where coaster trains seem to be either magically eaten up or spit back out onto the tracks. Tentatively breaching the door that says “Staff Only”, I had a fleeting vision of security guards grabbing me and giving me a swift inquisition. (After all, this is the area of “Cross this line and you shall swiftly be removed from the park and be allowed to return Nevermore.”) But as my eyes adjusted to the light glaring off hundreds of coaster parts and tracks, my fear was gone and my eyes glistened with coaster nerd joy! Both Ben, who has only hosted one tour prior to ours, and Zack, who was supervising the tour and overseeing the content, began giving us facts about the ride, the history, and why the Loch is such a landmark coaster. I must tell you here that there is not much about the park that Zack does not know. Even I found it difficult to stump him. No matter what coaster or area we were led to in the park; we were always allowed to stop the tour and spout out a question or two. It is amazing I must say, that even with my bombardment of inquiries, we were still able to finish the tour relatively on time. And that brings me to the main gist of this review my fellow coaster aficionados; if it is questions you have, it is questions you must ask. This tour encourages the curious mind and allows the average coaster guru to see what it takes to keep maintenance on each of the park’s coasters. At each of the Four Rides you are given a chance to go behind into the maintenance areas, speak directly with people who work on these rides everyday, watch the coaster crews hard at work, and stand behind the controls to see what it is like to operate such machinery safely. I would also like to mention that you get your own personal ride on each coaster before anyone else in the park is allowed to. As if that is not enough, you are also given a Quick Que pass for one ride on each of the four major coasters after the tour is over. A little inside scoop here; I quickly learned that the coasters feel completely different on the first ride of the day and when I asked about it, Zack explained the answer. No, I will not tell you what was said. That’s cheating! Take the tour and see for yourself just how different a very early morning, pre-crowd ride is. Oh and bring your camera! Have you ever been to an art museum and were watched closely by a guard who shouts “No flash photography” every five seconds? Well, you will have none of that on this tour. I could take pictures of almost anything and everything. It almost felt I was breaking the unspoken coaster law of silence by capturing sacred images of what is normally forbidden to see. It was invigorating to have such freedom. Let us focus for a moment on the word freedom. Arriving at the Griffon, we were given the freedom to ride up the service elevator all the way to the very top and walk -YES WALK- to the other side where a stationary coaster car awaits your perusal. Before you worry too much, let me assure you that your tour guide will make sure that you are properly following procedure. Still, let me repeat this: You are allowed to maneuver ON TOP of the Griffon, looking down and walking on the platform all the way around to the other side! I will NEVER look at this coaster the same way again. From now on,every ride I take will have me muttering to my ride companion: ’ “I walked there… and there… oooo.. and right there (pointing to a certain spot) I had my picture taken” speech. While basking in the joy of unhindered coaster heaven, I must have asked a hundred questions about the lift hill, breaking systems, anything that I could wrap my poor stuttering mouth to spit out. I am still, in shock… speechless over the experience. Right then, looking across the park at 205 feet in the air, I knew that this tour was worth every penny and that I would be taking this tour again and again. Going on the Roller Coaster Insider Tour was a chance to see all the inner workings of Busch Gardens Coasters that up until now, I could only use my imagination to fill in the blanks. Needless to say, it surpassed all my expectations. Value of the Memories gained: Priceless. 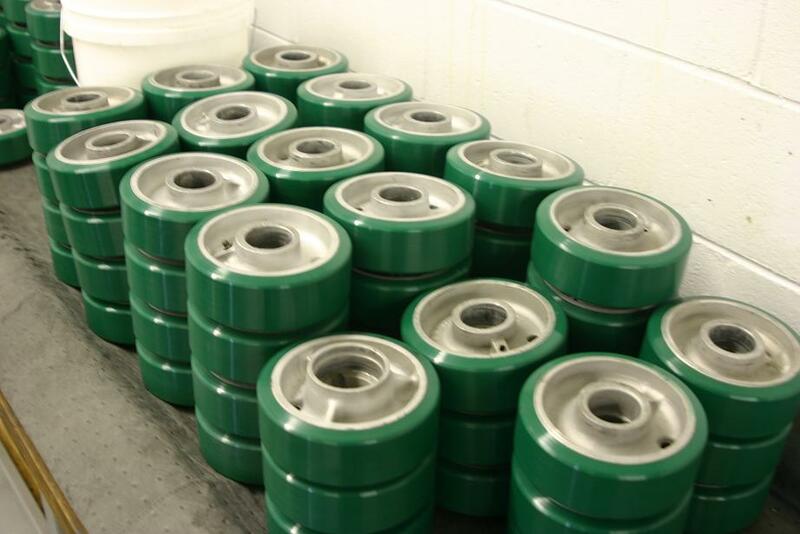 * Tour Loch Ness, Griffon, Alpengeist, Apollo’s Chariot maintenance areas and speak with maintenance personnel on daily maintenance/operation of rides. * Learn how our coasters are designed, built and constructed from concept to opening. * Learn cool facts about the construction/operation of our coasters. * Park History is shared along to tour to include some of the other Sea World Parks & Entertainment Parks. 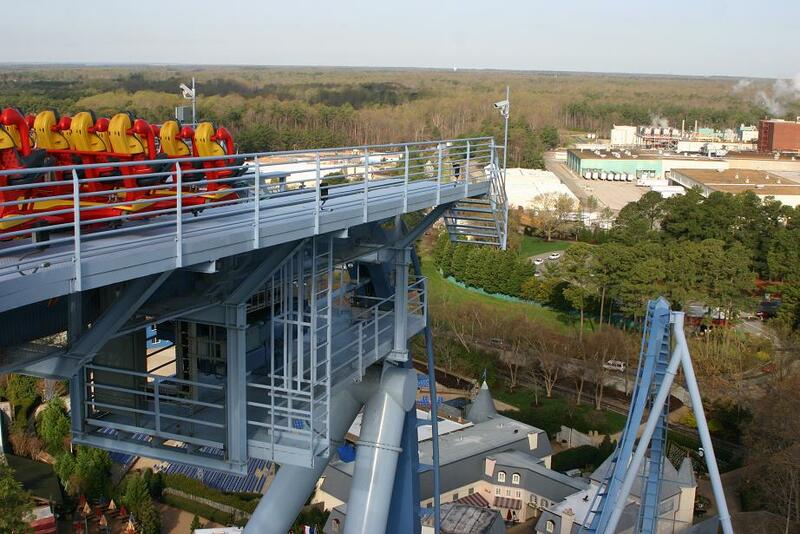 * Ride to the top of the Griffon lift via the elevator system. At the top, get out of the “cart” and walk around on top. * Photographer on the tour to take pictures. 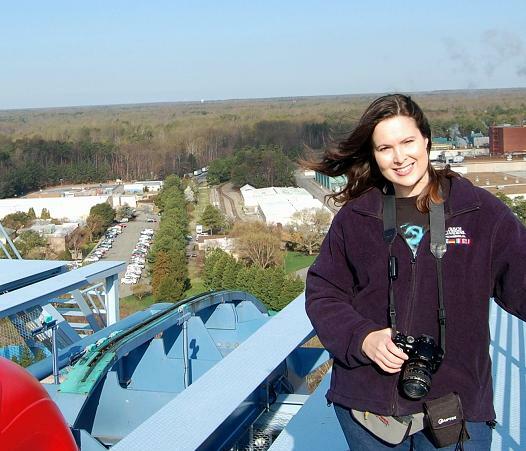 Photos are taken at the top of Griffon too! All personal cameras are welcome on the tour, but can’t be taken on the coasters themselves. * Ride all 4 coasters twice without waiting in line. Loch Ness, Griffon and Alpengeist are ridden before the park opens. Front of the line pass is given to all guests on the tour to be able to come back and experience all 4 coasters during park operation without waiting in line. * Photo CD of tour is included in price. * Questions are welcome on the tour. 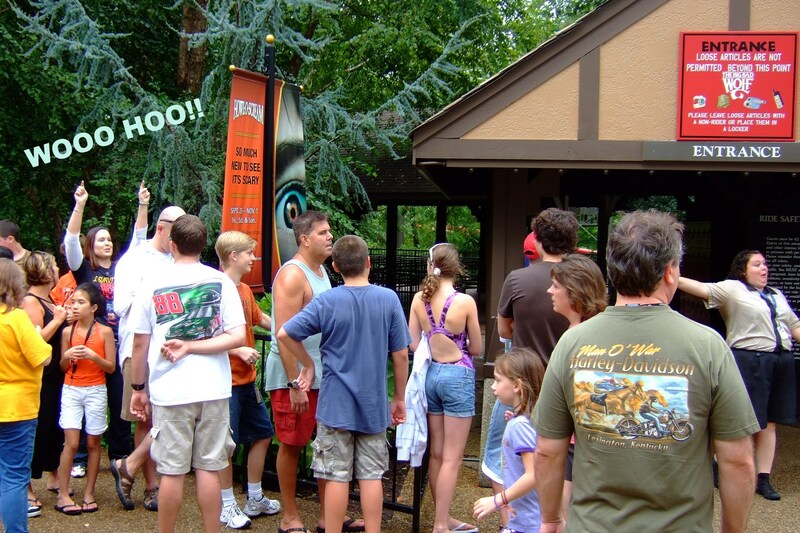 * Be the first guests of the day to enter the park! (You get to be let in at 7:45 am folks!) Groups are limited in size for a smaller more personal experience. **This story was originally written and posted on BGWfans July 30, 2009. The Big Bad Wolf had an amazing run of 25 years. Considered the best of its kind by legions of coaster enthusiasts, this classic suspended coaster’s reign of fright was now coming to an end on Labor Day of 2009. 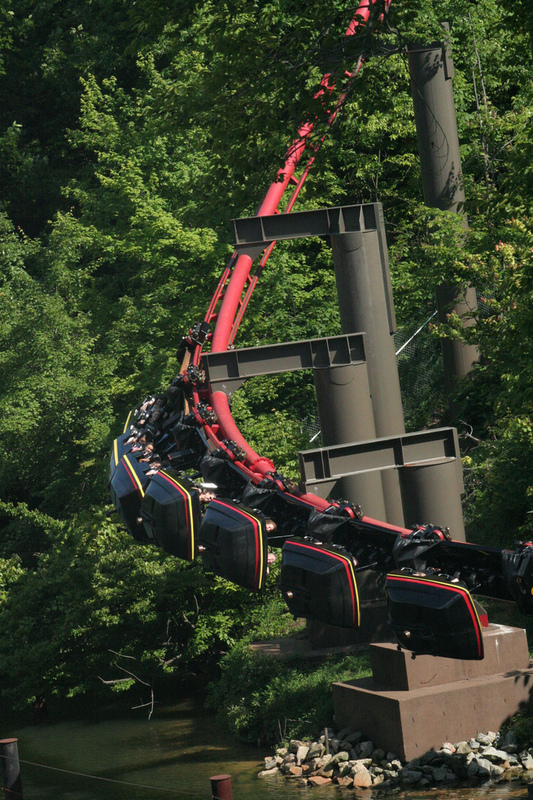 Busch Gardens Williamsburg Executives announced a mere six weeks ahead of this horrid date that due to high costs of maintenance the ride had reached the end of its service life. The replacement attraction of the Wolf would remain unannounced apparently. Now I love the theme park dearly, but all I can say is …BOOOO!! Shakespeare once wrote that “The robbed that smiles, steals something from the thief.” Sadly, I could not smile and move on once I heard the news; nay, I wept and begged, and never stopped fighting. 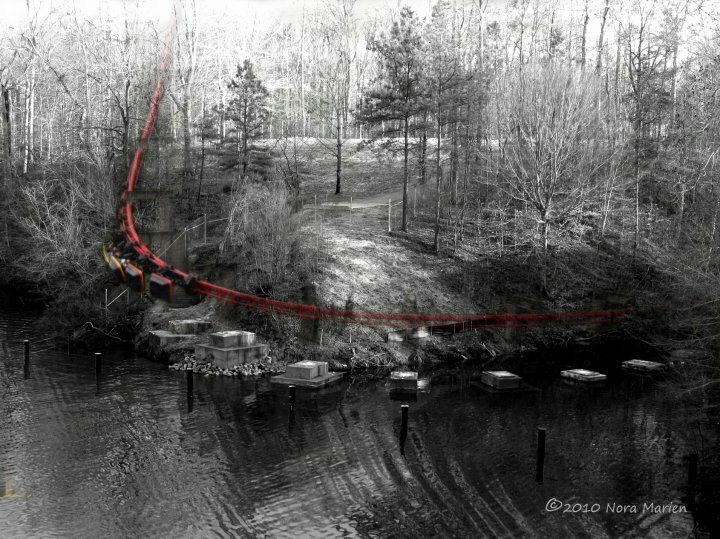 For those of you unfamiliar with the ride, The Big Bad Wolf stood at a mere 99 feet; small in coaster standards. 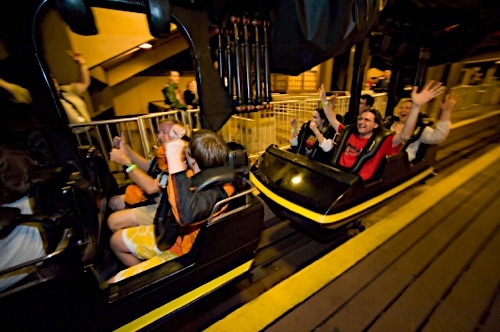 It made up for it’s lack of height by thrilling riders with a unique experience of being dangled in a black cradle cars that had the ability to swing the riders back and forth at a maximum 110 degree angle during the entire ride. A rippling motion of the coaster cars was the beauty of the Wolf, as it swung through a well themed Bavarian town and took a sweeping plunge over a river below. The relatively slow speed of 48 miles per hour was irrelevant. Much like what the humidity does to the heat index factor in Virginia, the true speed of the ride was deceiving. Being carried on the Wolf seemed as if you reached speeds closer to 80 mph. 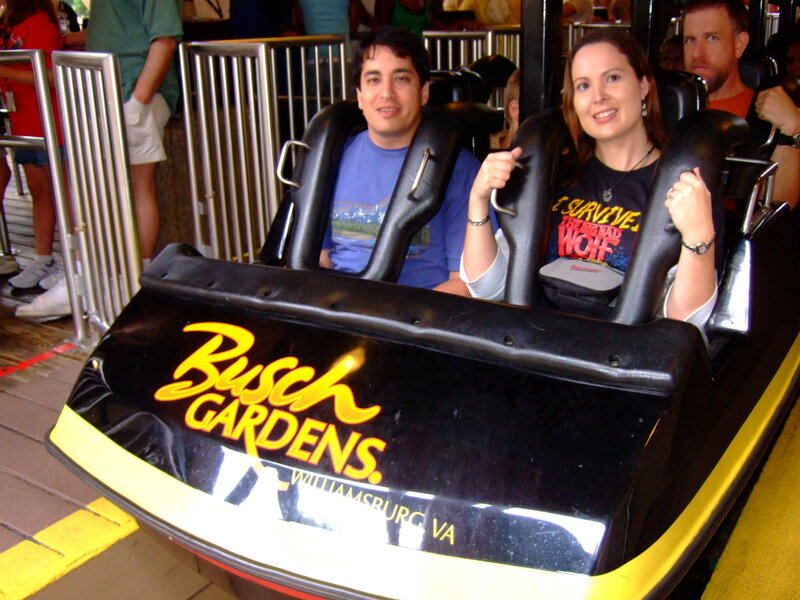 This was due to the sharp banking while being swung at extreme angles throughout the ride, or as Busch Gardens called it, “traveling at the speed of fright”. Frightening was indeed the key word with The Big Bad Wolf. Everyone knew it was the one coaster in the park without industrial-powered-airport-standard spotlights to shine up on all the riders. (Seriously, there is no reason to use the Bat Signal on any coaster folks). This lack of lighting left you completely in a pitch-black quiet during those late night rides. The buildings that you swung through and around; the trees that bent oh~so close to the coaster tracks, and the cold shimmering moonlit river that waited for you below that final drop, were only sensory dangers as you flew by. Another frightening aspect of the ride is that it was set farther away from the park. The red tracks were found nestled in dense foliage; making the rider feel alone on their adventure. So well hidden was the ride, the isolation fear factor could be likened to any one of Steven King’s novels…no one can hear your scream! Anger: My hate was uncontrollable and aggressive. I attacked with swarms of letters and petitions; emotional, passionate language flowed to everyone I could think of. “How could you? Why are you doing this to a great coaster?” etc. Bargaining: The closer the end date arrived, the more panicked I became. I wrote letters with solutions, hope of saving my dear ride, begging them to please consider alternatives! Acceptance: I did all I could do. I gave everything I had to help Save the Wolf, nothing was going to change that fact. I began to make peace with the realization that I would never see that beautiful coaster ever again. 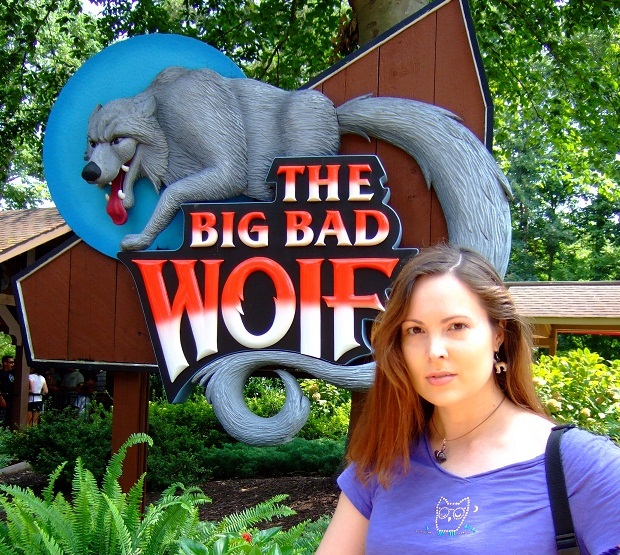 It was only after acceptance that I decided to bid on the final ride of the Big Bad Wolf; an idea I was fervently against at first because of ethical reasons. Ultimately, I caved to my inner demons and decided to risk my hard earned dollars for a chance to say the final – final goodbye. My goal was to be in the top six bidders at least and thus securing a spot on either the front or back car; the most prized positions of any coaster fan. Surprisingly I won the 6th spot and relief ran through me. I would be on the very last ride of the day. I would be one of the final people to say goodbye to the Big Bad Wolf forever. It was a rare instance of crying for two completely different reasons at exactly the same time. Waking up early with a clenching nausea in my stomach, the dreaded day had arrived. 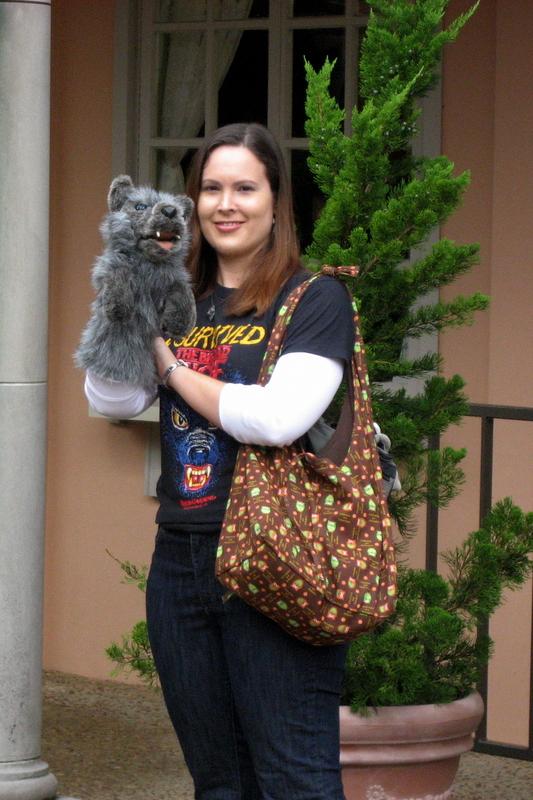 I donned my outfit that was designed to show the world my complete enthusiasm for the Big Bad Wolf. 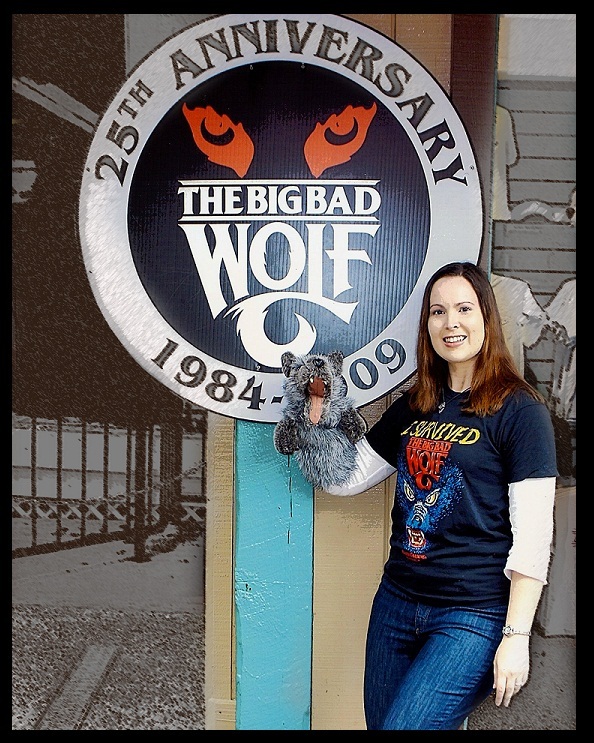 I looked ready sporting a vintage 1984 “I survived the Big Bad Wolf” (complete with the old original logo on the front), hanging wolf earrings, a wolf necklace, and an actual Big Bad Wolf Puppet to carry around for amusement purposes. OK, perhaps the outfit made me look a little unbalanced and demented to anyone not inclined to such a show of passion; but as long as my tomfoolery made them smile… it was worth it! Dark rain clouds hung ominously overhead; ready to pour their bounty on all who dared venture out of their homes. No amount of rain could stop me boy howdy! Only the threat of lightening could thwart the operation of coasters that day. Thus, I threatened all those evil clouds that they better not produce one single lightening bolt or I would find a way to fly up there and personally kick each and every one of their fluffy rain laden butts! I think it worked. Despite the fact that my whole aura was as dark as the morning sky, my husband still came with me on this quest. His sworn duty was to act as my personal cameraman and designated cheerleader when emotions ran high. We arrived at the Busch Gardens early enough to be there when the Germany (Oktoberfest) section opened to the general public. And older fellow, perhaps in his late 50′s, stood watch at a pitiful looking rope that kept a hoard of drooling coaster hounds at bay. He shouted at the crowd. “People! Germany opens at 11:00 and the Wolf opens at 11:30!” No one budged. Instead, we all looked at each other; sizing up the competition. Who would win out for the first ride? One thing for sure, the fight would be nasty. The goal was located about 150 yards away across the San Marco Bridge; the wet, slippery monstrosity that connected the two areas of the park. At the end of this bridge is a slight incline for those who are fit or a Sisyphean challenge for people like me. (Sisyphus- look it up kids). At 11 am sharp, the man released the rope and pounced spryly out of the way. The crowd rushed forward. Little kids sprinted ahead and I growled in frustration. My 30+ year old-out-of-shape body with wobbly knee joints cried out in defiance. Still, I was set on winning. No snot nosed kid would beat me that day. Then a miracle happened. This miracle was called X-box and Playstation. Those TV induced, lazy punks started dropping back. My steady and determined gate passed each and every one. Secretly, I taunted them all. I saw the entrance ahead. A new-found energy overtook me and I doubt I ever ran faster in my life. The ground was slick and dangerous, and I prayed that I wouldn’t slip and break anything. In the end there were only a few folks that made it ahead of me. Counting quickly to make sure I was in the top 28, I released a primordial howl of relief and then clutched my sides in pain. Looking back at the swiftly increasing line, I did an awkward victory dance. My husband, who walked patiently across the long bridge that has just served as host to the geriatric 100 yard dash, approached me laughing. “You should have seen yourself! God that was hilarious!” He then asked me if I pushed down any kids along the way, and I denied the accusation. I did mention to him that yes, I had thought about it. A staff member announced that they would open the ride as quickly as possible. For the second time of the day, the rope swung open. The line of people crowded in. With much success my husband and I found ourselves in our coveted back seat, ready to howl and scream on the first ride of the day. Leaving the ride, I was stoked. Even if it rained all day, nothing could change the fact I would be the first and last ride of the day. It was so worth the shin splints and sore ankles that were already plaguing my aging body from running like an obsessed loon. After getting some amazing footage of the coaster, the bottom dropped out of those pesky rain clouds. My husband and I retreated to the safety of the Festhaus (a very large dining area of Busch Gardens) and relaxed with a nice lunch and a glass of wine. The rain started to break, and we both ran out for more rides on the Wolf. All and all, the weather gratefully allowed us at least five rain free rides so far. I felt no need to ride the other roller coasters. I mean, they would all be running the next day; for the Wolf…this was it baby. I had to meet the park officials at 5:30 pm in front of “Wolf Gifts”, the sparsely stocked Big Bad Wolf gift store found outside the Ride’s exit. The staff kept this information on the down-low so there were no onlookers and harassment from other park goers. So tight was the security around the Big Bad Wolf, I became slightly paranoid that one slip of the tongue would somehow result with me being banned from the park. The winning bidders had to stand in line at the Wolf Gifts Merchandise Stand and pay their auction money. I proudly handed over the cash and received a lime green wristband; the brightly colored badge of honor. People around this area quickly learned that whoever wore a bright green wristband were the last riders of the day. After securing my final ride, I spotted a news crew roaming around those waiting in line for the Big Bad Wolf. In all my “Wolf” garb, I must have looked like easy prey because the news crew swooped down on me like a mosquito and asked me for an interview. The reporter, Jeremy Crider, a pleasant and professional young fellow, asked me a few questions and I tried very hard to not become an emotional wreck in my responses. I heard shouting which broke my focus from the news crew. Upon turning around, I realized with horror that MY ride had already boarded and the gates had closed! My husband, smirking, was waving a sarcastic goodbye. I returned the sentiment with a plea to open the gates and brought forth my ultimate power of sad puppy-dog eyes and an undeniably large pouty lower lip. EVERYONE in the entire station joined in the cheer until the gates reopened (strictly for wacky me)! Hopping into my seat, I started HOWLING at the top of my lungs. Then station crowd all began to howl with me in unison until the coaster left the station. I found out later that this whole event was captured on film and was played on the 11 o’ clock news that night. Bless you Channel 3. You made my day. The park closed at 7pm and it was well known that any rider in line could ride the Big Bad Wolf in whatever seat they wished, no matter how long this took. As if on cue, the rain began to pound down at exactly 7pm. Now, since Busch Gardens announced they were closing the classic coaster, it has rained every single time I have gone to the park. Seriously, each and every time. It is as if the Coaster Gods are weeping for me. Either that, or the atmosphere could sense my mood and therefore, reflect my feelings in some weird mutant like power. A few of us even took a poll of how far we could go if we started grabbing mementos of the actual roller coaster before being caught and arrested. None of us acted out our verbal and perhaps, mental rebellions thankfully. So it is true. No arrests were made that night. This surprised most of my friends and family the next day as the expected to see me on the news chained to the Big Bad Wolf in protest. Yes, it had crossed my mind. The park’s general manager, Jon Reilly, came to speak with us during the tantalizingly long wait. He congratulated us on being the final riders of the day and expressed his gratitude for our dedication and love for the Big bad Wolf. He spoke with such fondness of the ride and sincerely regretted that the Big Bad Wolf could not continue to be operational. I looked back to my husband who watched it all with tears in my eyes. A roar of cheers and applause arose from the crowd that had gathered around our little huddle. Darn straight! It needed to be said! With that, the group photo of the auction winners was taken. We were then told that the last ride would go like this: Riders would be called out individually by highest to lowest bidder. Each rider would then go through the line and click the turnstile one last time, then select their seat. Once all the riders are ready, the gates would open and the last ride would begin. Skipping carefully down the rain covered, slick path of glory, I certainly did not want to look stupid and fall right in front of the news media. My happiness soon faded as I halted in front of the turnstile, the metal device never looked so menacing. This was it; no more will I pass this point. Tears began to well; butterflies circled my stomach. I forced myself through the barrier and looked at the empty seats. Heartbreak. The empty stares of employees, the lonely dim lighting of the station, the smell of the grease from the coaster’s breaking system, and the slight echo of murmurs from onlookers will be burned into my memory forever. I noticed that the two highest bidders took the front seats; as expected. Which was fine. I wanted my favorite seat in the back anyway. (The best seat on the Big Bad Wolf; don’t even deny it!). I clung to the silver metal handrails, for the last time; I touched the pole that held the roof of the station securely for the last time, and I leaned heavily on the gate to peer down into that empty coaster car…..for the last time. Emotions rampaged through me. Excitement, nervousness, joy, sadness, anger, and heartache; the sensations reflected in my eyes and face. 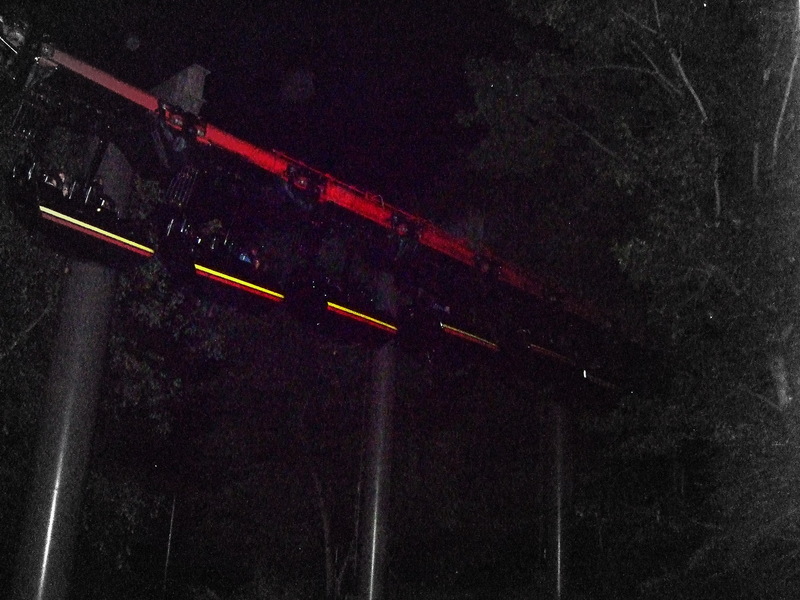 The final ride on the final car; the 7th car, September 7th, at 7:45pm. The people riding along with me exchanged handshakes and expressed our sincere feelings to each other. The rest of the empty lines quickly filled with the other riders and we heard the dreaded words, “Boarding guests, please take the seats and pull down your harness over your heads so they may be checked for you….” The gates opened. The world felt it was in slow motion as it had to be the slowest crawl of any group of riders in a coaster. My legs felt light weights stepping over that black car with its red and yellow stripes in order to sit down in the front right seat of the back car. The harness, felt like and anchor dropping on me. I looked up to my husband, who was perched above the station on a walking platform. He was filming me. I made a “falling tear” gesture and waved a sad farewell. The ride operator shouted, “Is everyone Ready? ?” The response was a sad lifeless cheer. The operator continued. “Come on now, is everyone one ready to ride?” This time, we mustered the real applause the Wolf deserved; pushing our disappointed spirits away to give the ride true heartfelt appreciation. The coaster cars jerked forward and with the familiar sounds of the breaks releasing, the final ride of the day left the station followed by howls from everyone riding or watching. As if my questionable weather-induced-mutant-power prayers were heard, the rain had stopped as soon as we all left the station. The Park had been closed for about an hour at this point, and the night was completely dark. We could barely make out the outline of the trees and tracks as it made slight dip out of the station and into the night to complete the little turn to the left and then to the right to climb the first hill. Murmurs of “I’m going to cry” were mixed in with constant cheers as the coaster approached the first hill. A few flashes from cameras were seen in the distance. 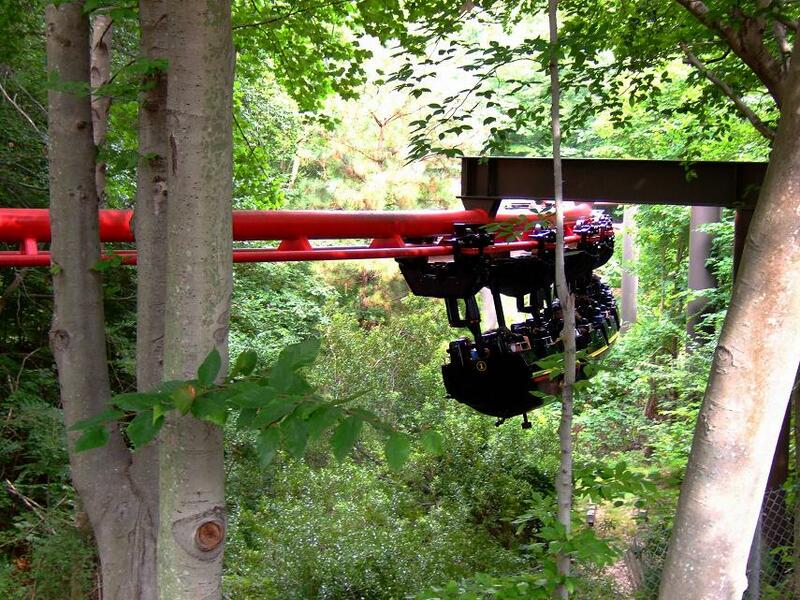 With the first click of the lift chain, tears began to fall. I sobbed and cheered all the way up to the top. I vaguely remember looking at the hazy lights of the Festhaus and the Autobahn bumper car house that was eerily Ghostown empty. We had reached the point of isolation. No more could we hear the cheers of other watching us go up the hill. We were alone with the Wolf.. as it should be. I felt the first car slide off the guide rail and begin to pull the rest of the cars down. We were yanked left through a German building, swooped right, and then left in a matter of seconds. Little lights flickering in windows were the only giveaway that a Bavarian style town was even there. I swore I heard a haunted wolf howl and a church bell ringing that was once part of the Wolf in years past. At this moment I felt the true soul of the ride. Yes. I believe wholeheartedly that coasters have a soul. It is plausible that people are able to imprint bits of themselves on inanimate objects once they become emotionally attached to them. It is all about perspective. 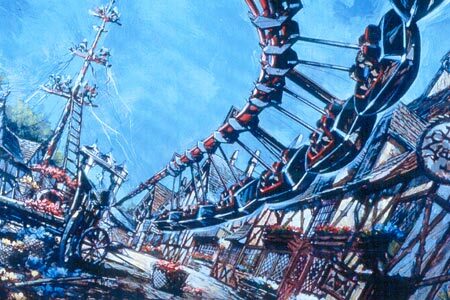 The Big Bad Wolf was designed by one of the best coaster engineers of all time and had thrilled over 29,000,000 riders. With so much love and appreciation, this ride had developed it’s own distinct personality; a collective soul filled with projected emotions. So perhaps in some way, the Big Bad Wolf knew this was the last ride of its long life. If so, I hope it sensed the appreciation from everyone that night. I touched the side of the car and gave it a fond pat. Swinging around the horizontal loop and slowing to a near stop as it turned slowly to the right; the last hill was approaching. A hush came over the riders. The jerk of the coaster hitting the lift chain caused us all to snap out of our reveries and we started a loud chant of “WOLF! WOLF! WOLF!” which continued all the way to the top. I could see the lights of the Loch Ness Monster, the Griffon, Apollo’s Chariot, and the Alpengeist. Suddenly, visions of each and every ride I took on the Big Bad Wolf played in my mind. It was almost as if the Ghost of Christmas Past was allowing me to see various stages of my life. In 1984 the coaster opened two days after my seventh birthday and I was there in line; eyes shining brightly up at the tracks. Hundreds and hundreds of times I must have rode this coaster from age seven to thirty two. Like the story the “Giving Tree”, this great ride saw me as a child, as a teenager, and as an adult. And the girl loved the roller coaster… very much. And the ride was happy. Despite my tears, the pull from the front cars let me know it was about time to plunge down the last hill. Because I was siting in the very back, I experienced that wonderful stomach dropping swing to the right, then to the left before the coaster cars rushed swiftly to the bottom. In a blink, the coaster swung over the water and with a quick snap to the left and then to the right, and then to another pull to the left. …… the final ride was …..over. It seemed like the fastest 3 minutes and 30 seconds of my life. Even though I cheered along the other riders, I knew that this was the last time that I would see the familiar glow of the approaching station house. I even thought about how I would never again experience the slight jerk back when the breaks locked down on the wheels below. 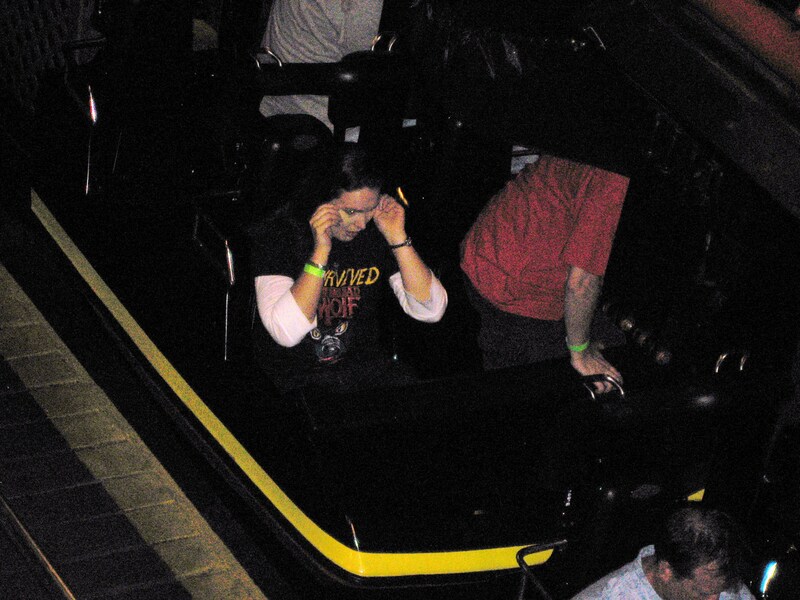 Oh Lord, how getting out of that black beautiful coaster car was so hard. I did not want to lift up the harness and I doubt I was the only one. Chants rang out for another ride. We all pried ourselves from our beloved coaster and just looked at it. Many of us wiped tears from our eyes. The whole house went quiet with contemplation. 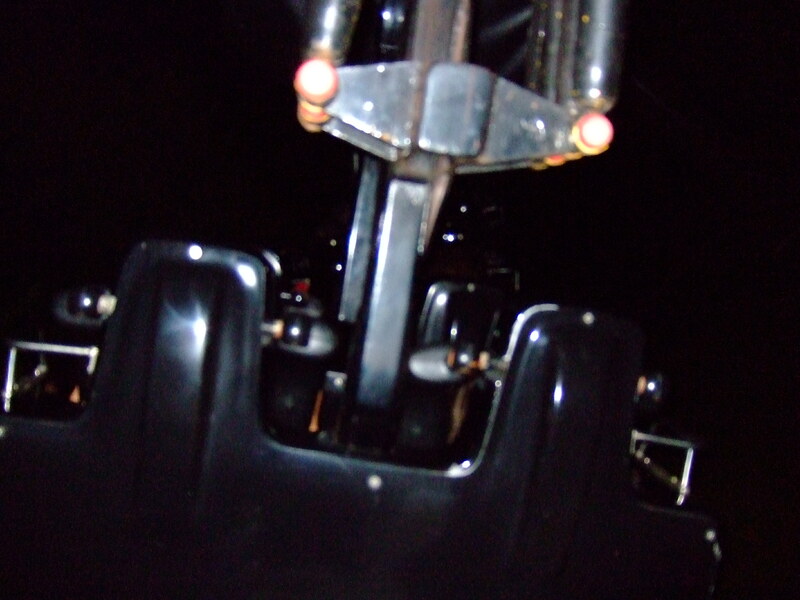 I leaned over and hugged the pivoting fulcrum that hung from the coaster car’s wheel assembly and said a mental goodbye. Slowly, the last riders started to leave the station. Walking over the bridge that allows riders to exit, I howled again. I shared twenty five years with the Big Bad Wolf. Now it was over. I have thought about this classic coaster every day since September 7th. Perhaps with the passing of time, I will be able to cry less and smile more when I think of my dear friend; the Big Bad Wolf. Oh the mighty Wolf sleeps in its faded tracks of red. All lonely and alone, it awaits its day of dread. That the twists and turns all remain engraved in our heads. the engineers who made you, really got it right. rest noble coaster, I wish there was more for you to do. you would stay here forever, and end our coaster blues. the feeling of the swinging cars, can never be replaced. 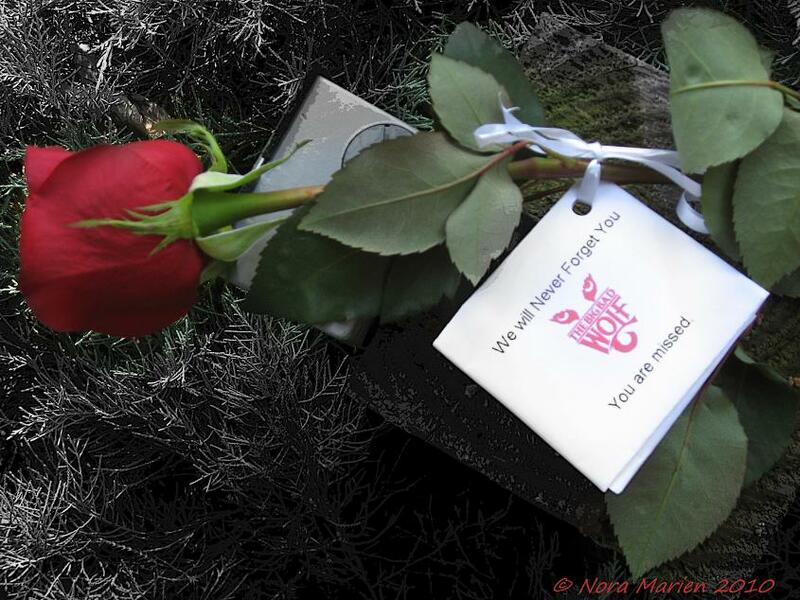 we so wish that your time here with us, would never, ever end. Your majesty and legacy shall forever continue on. We all say goodbye and in sorrow, bow our heads. For we shall never see your tracks again in that glorious shade of red.